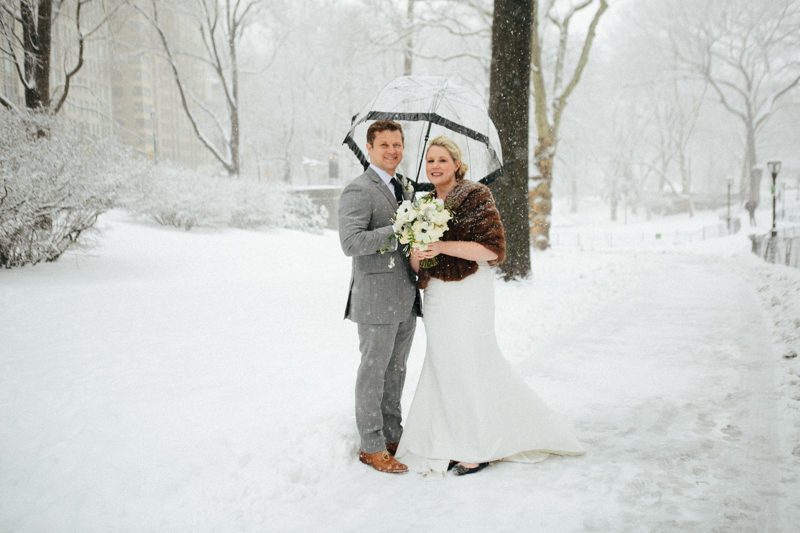 Early on the morning of Eimear and Jon's wedding they called me to confirm a change of plans: their elopement was NOT happening in Central Park. I grabbed my glasses off of the nightstand and peered out of my window to see what we were up against. Brooklyn was covered in several inches of snow, and it was coming down hard. No way. I mean, we could have made it work. Whatever you want for your elopement, as long as it is legal, moral, and at least somewhat reasonably safe, I'm in. 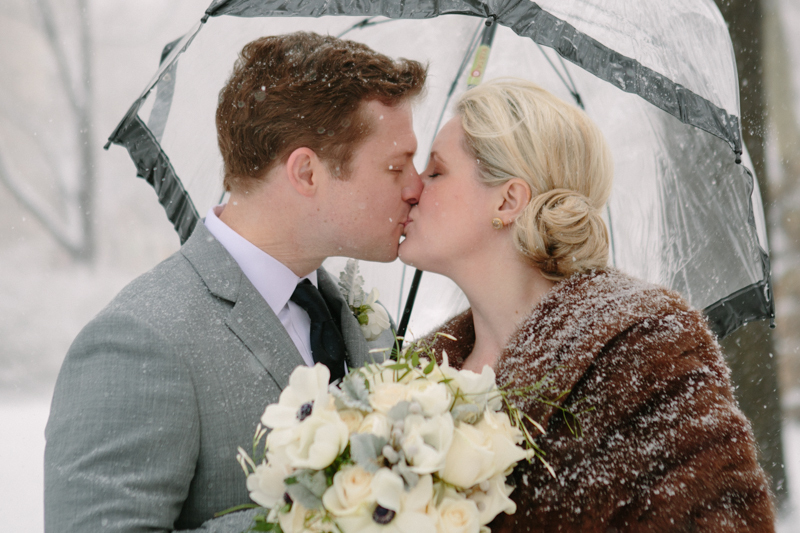 Bundling up so you can say "I do" in the middle of a snowstorm is absolutely in my wheelhouse. Judie the officiant confirmed she would, too (last winter she shared some of her hand warmers with me and they are a total game changer; between them and my unsexy oversize puffer coat, I can run around anywhere in frigid temps). However, this duo opted for a Grand Central Terminal wedding instead, and it worked out beautifully. Eimear's anemone, lambs ear, rose and ranunculus bouquet was crafted by Michelle Edgemont. 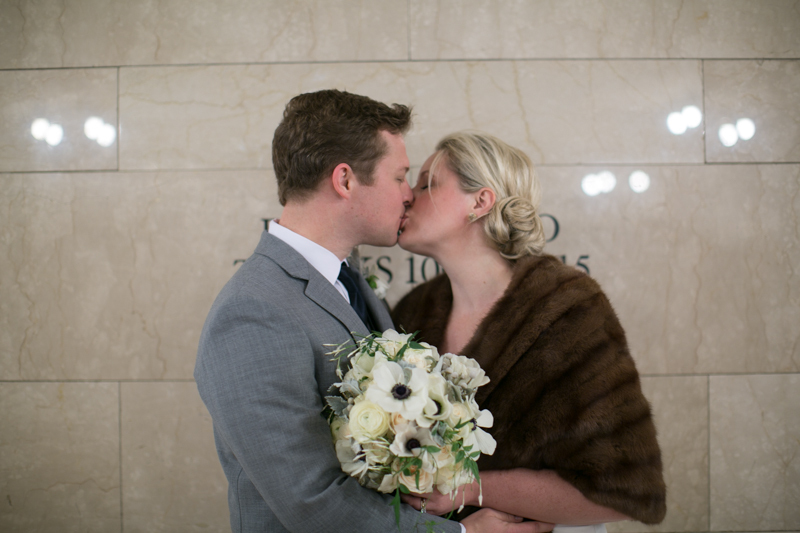 It coordinated nicely with her vintage-y bridal ensemble and the classic art deco details of Grand Central Terminal. We made it to the park afterward. Jon and Eimear wanted some outdoor shots, and to be honest, I really wanted to run around in the snow for a little bit, too. We bought the last clear umbrella from an umbrella/shoe shine/flower salesman (only in New York!) and caught a cab to a pretty corner of Central Park. There we were able to take a few brave shots with the snow swirling around us. can you get married in Grand Central? can I take wedding photos in Grand Central Terminal?